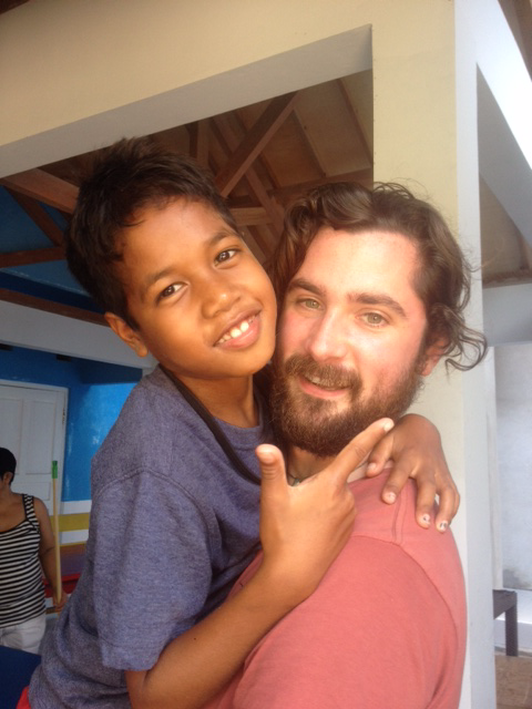 BALI, INDONESIA- Jodie O’Shea Orphanage is tucked away on a small, rocky side street in downtown Denpasar. The short road leading to the entrance is not for the faint of heart, or at the very least it’s not for those susceptible to motion sickness. Littered with potholes and rocks, it’s probably only two hundred yards but it feels like half a mile as you swerve and bounce along next to what some might consider a river. Strewn with trash, it’s disgusting to look at. It’s one of those sights that immediately turns your stomach and makes you wonder the local clean drinking water could possibly come from. It’s hardly a picturesque run-up to one of Bali’s biggest orphanages. I’m visiting this morning with my friend and travel partner Lauren, who spent three months volunteering at the orphanage earlier in the year as an administrator and part-time mommy. Out to save the world, Lauren spent virtually every waking hour cleaning, dressing, and coddling the children, re-doing the volunteer handbook, chatting up visitors, and doing everything she could to improve the day-to-day running of the place. We’re coming back today to see her friends. When visiting an island like Bali it’s easy to get caught up in the Western Expat scene, though that can really be said for any destination around the world. For the most part, you’re sleeping in a place that accommodates to outsiders, and as a traveler you are immediately drawn to the sights and activities that the locals have long ago shrugged off as having no consequence to their lives. Yet in Bali, this is a dangerous trap to fall into since beneath the façade of the tourist industry there is a small island that subsists on a standard of living much lower than any of us could ever fathom. Visitors tend to get swept up in the happy smiles and flowers in the hair of the Balinese and assume that everything is groovy. Yet sometimes it’s helpful to take the time to see the “other side”, and realize that Bali may be an island paradise, but there’s more to it than dive sites, surf breaks, and yoga retreats. It’s a somewhat difficult line to straddle with respect to visiting an orphanage, and I don’t mean to imply that this is an activity that people plan to obtain further insight into the plights of the Balinese. I am visiting only because Lauren worked there and is still friends with quite a number of the volunteers and administrators. The idea of touring an orphanage as an attraction on a large scale is a destructive one that I heartily discourage, though I am fortunate I had the opportunity to do so. We are greeted at the door by Maxi, a small, smiling Balinese man who speaks no English whatsoever. Maxi is on the books as a security guard, though it seems that he’s really just a big teddy bear of a doorman for the dozens of people that are constantly passing through. The kids need a gatekeeper to look after them and ensure their safety, and Maxi is just the man for the job. He immediately puts me at ease with a hearty handshake and a big smile, and my initial hesitance at visiting is quickly dispelled. As a relatively intrepid traveler who has little hesitation butting myself into certain situations, I’m hyperaware to a fault when my presence could be perceived as unwelcome, and visiting an orphanage is one of those situations. I wanted to learn more about the kind of work they are doing and meet some of the kids, but at the same time I recognize that I am just one of a string of faces that they’ll see once and never again. A visit might play a pivotal role in my social awakening as a privileged first-world traveler, but it can hardly be doing right by the children. Either way, Maxi is cool with me, and I appear to be cool with him. Walking through the gates of what can only be described as a compound, it’s clear that bedlam reigns free behind these doors. It’s not quite anarchic since there seems to be a controlled element to the chaos, but there are kids running everywhere, wild and free. We’ve come during play time. There is an element of greenery behind a few fences, though it’s clear that maintaining a grassy patch becomes quite difficult with 80 screaming kids running around all day. The effort is there however, and situated with the children’s murals painted on the wall it creates a comforting atmosphere. Wading our way through the sea of children past the dorms rooms, we make our way towards the back, where the kitchen is. Passing the bedrooms, I can’t help but be astounded at the conditions the kids live in. The rooms aren’t dirty, but they are messy—that’s to be expected when a child is living there. What stands out is how many bunk beds are in a single room. As someone who’s been living on the road for months at this point, I’ve at times whined for my own space where I can just lay down my things and not be bothered or encumbered by the belongings or emanations of others, and it immediately makes me feel like a spoiled brat. These kids are 6, 7, and 8 years old and they are sharing bunk beds in dorm rooms that accommodate eight or more. Many consider it a basic necessity of personal development to have one’s own space to simply…think, and not be bothered. To me, that’s a basic tenet of a successful life. To them, it’s a luxury they can’t comprehend. Walking through Jodie O’Shea with Lauren must be like taking the 4 train to the Stadium with Derek Jeter; we have to stop every few feet as another small girl runs up to her and reaches out, waiting for a large embrace. She’s obviously a popular figure around here—she’s been gone for a few months, and tons of the kids still remember her. By way of association however, I’m immediately “in” with a bunch of the kids, particularly the little boys who absolutely dig the concept of facial hair (I was rocking a fairly POW-esque beard at that point). There’s a clear distinction, as in any large-scale gathering of children, of the kids that are gregarious, open, and want to play, and the ones that are too cool for school. The latter sit perched atop a ledge on the upper level of the dorms surrounding the kitchen, looking down to make sure you can see them being cool. Some things transcend cultural boundaries. For the most part the kids living at Jodie O’Shea are younger, many under ten. When one conjures the image of an orphanage, the immediate thought is that the children have no parents to care for them. But here, as is the case in many orphanages in poor areas, the kids have families that simply can’t support them. It’s raises a heart-tugging moral quandary: what’s a “better” situation, to have parents that have passed away, forcing you to live in an orphanage, or to have parents that have just dropped you off at an orphanage since you’re a burden for them? It’s hardly a cut and dry scenario where the families have absolutely no choice but to place their kids in the care of a third-party organization. Oftentimes, they just can’t be bothered to look after them for any number of reasons—the parents have split, they work, or are just apathetic to the idea of actually raising a child together. It’s wonderful to know that there are organizations hat exists that take children in regardless of their family situations, but at the same time it just makes you wonder about how the Balinese view an institution such as Jodie O’Shea. The reality of the situation is that for most of the kids, they will have much more opportunity being raised at the orphanage than they would at home. The most apparent benefit is that they learn English, an immediate ticket to a better-paying job in Bali. If they had grown up in their home villages, speaking only Bhasa Indonesia, or worse, Balinese, their job opportunities would be severely limited or nonexistent. Yet interacting with the constant stream of staff, volunteers, and visitors at Jodie O’Shea exposes them to a language they might never have learned on their own. Perhaps the most important lesson for the kids is that there is a life beyond the confines of the small Balinese community from which they hail. In a backwards way, living in an orphanage lets them see a variety of things they might never even have known existed otherwise. I’m finally introduced to Letitia, the Swiss volunteer manager whose hair is simultaneously being pulled in four different directions by four little girls. From the look of it, it’s a wonder she has the free time to get out of bed in the morning, let alone attend to the litany of operational issues that running the volunteer program at an orphanage entails, but she seems to be holding up with a smile and the right attitude. Jodie O’Shea is staffed by a half-dozen Balinese workers who are responsible for the day to day operations of cooking, financial management, and finding sponsors for the children. Everything else is run by volunteers who visit the orphanage on their own time, their own dime, and largely on their own terms, though this has changed recently. There aren’t any set rules for how long the volunteers are supposed to stay, and they are expected to pretty much help out with everything while they are there. The experience seems like it would be fairly overwhelming for someone who didn’t have significant experience working with underprivileged children. I’m sure there are places out there where volunteers can follow a strict regimen for what is expected of them, but Jodie O’Shea is not one of those places. The volunteers are expected to assist with virtually every task from sun-up until sundown, and it appears to be an overwhelmingly exhausting experience. Yet I’m not here to volunteer; I’m only here to visit, and only for the afternoon at that. Today we are taking the kids for swimming lessons at the local pool—the Balinese equivalent of a country club lets the orphanage use their facilities a few days a week to teach the kids how to swim. The instructors are…well, volunteers. Today it’s Lauren, an Australian volunteer named Lisa, and me. Piling into the back of the bus, the kids immediately become kids on a bus ride—singing and horsing around, and playing with whatever swim toys they are able to get their hands on. Sitting next to me is Esto, a little boy I befriended on a previous visit to the orphanage. Esto (pictured above) has developmental problems with his legs, so he’s unable to walk normally like the other kids. It’s by no means a debilitating issue; he can still move about on his own and play with the others. But we all know there’s a certain age when any sort of issue handicapping your ability to keep up with the rest of the crowd is going to have a detrimental effect on your disposition. Yet this doesn’t seem to affect Esto one bit. Aside from a greater openness to bonding and playing with the older volunteers and visitors, Esto is nothing but a big, walking smile. Arriving at the pool facilities, the kids race out of the van and into the locker room. They know the drill here, and are eager to get in the water—before I know it they are all changed, and jumping into the pool. Keeping an eye on the boys as the only adult male with the group, I follow them out and take a dip myself. To refer to this hour as swimming lessons is a bit misleading…it’s basically free swim with three overseers to ensure that no one drowns. Formal training in the art of swimming is clearly not going to happen, but that’s OK—all of the kids have smiles on their faces and look happy to be out of the orphanage, especially since they’re now playing in a pool. I spend most of my time with Esto…he might be able to walk perfectly fine on land, but it’s clear that he struggles in the water. I’m not sure whether it’s due to the condition of his legs or the fact that he can’t swim, but even with floaties on his arms he still isn’t comfortable being more than an arm’s length away from me. I’m happy to have him near me, but at the same time I have to remain vigilant since I’m also supposed to be keeping an eye on the other kids as well. There are 10 of them, and every minute or so I find myself counting in twos, five times, in an effort to ensure the continuous respiration is being practiced by all. Yet aside from wanting another person to play ball with, none of them are particularly concerned that I’m paying Esto so much attention. They range in age from five to 10, and for the most part, all of the older ones are keeping an eye on the little kids. You might expect the bigger kids to want to play on their own, rougher and faster as children are wont to do, but that’s not the case at all. The one thing I decidedly do not have to worry about is an older kid holding a younger kid’s head underwater because they think it’s funny. There’s none of that horseplay here. Soon our hour is up and we have to rustle everyone out of the pool. They all know it’s time to go and race into the locker room to change, leaving the volunteers to pick up the remnants of destruction they’ve wreaked upon the pool toys. All in all they are a surprisingly self-policing group, and quickly gather outside the locker room when dried and changed. Someone has busted out the post-swim snack bag, and one of the older kids takes it upon himself to apportion a juice drink and bag of chips to everyone, including me. This kid is one of the too-cool-for-schoolers who hangs out on the upper ledge in the orphanage, and it really touched me that he wanted me to have a bag of chips the same as everyone else. It’s one of those times when you want to make sure that everyone has enough, so it is difficult to suppress the urge to deny the gift, but it’s hard to discourage that kind of generosity. Walking out of the locker room last is Esto; he does everything a bit slower than everyone else. There are a few of the local men gathered in the lobby and they are casually joking with the kids in Bhasa, so I can’t really understand what they’re saying, but it’s clear the kids are wary of the older adults. It’s as if they close ranks around themselves. The older kids clearly look after the younger ones to make sure they are not bothered by any unknown persons. The older boy distributing the chips walks over to Esto and makes sure he gets a drink and a snack, just the same as all of the others. It’s a heartwarming scene. It’s the simple little interactions that often turn out to be the most memorable. I only spent a few mornings at the orphanage and never interacted with the kids for more than a few hours, so I can hardly claim to have had anything more than a small observational window into the kind of lives they lead, which must be unimaginably difficult. As someone who is fortunate enough to have a massive social support network of hundreds of friends and family members, I can’t conceive of being in the position where no one can or wants to raise me, so I have to live and grow up in an orphanage. Yet that small window of time I spent with the kids gave me hope that there is a future filled with love and compassion for them. 80 kids living under one roof is a social situation with daunting prospects for success, and while I’m certain not everyone treats each other the way they would like to be treated, it’s very clear that the older kids do not see the younger kids as fodder for bullying. They see themselves as members of one, cohesive familial network, and by and large the older kids assume the role of overseer for the younger ones. It’s a terrible place to be, but in a sense it gives me hope that when left in dire situations, humans still have the capacity to be good. Up until now, I’ve spoken mostly about the younger children at Jodie O’Shea, but what I see as the real difficulty in running a place like this is what to do with the teenagers. Having been raised in an environment all their lives where they are to some degree expected to be caregivers for the younger kids in a very particular social vacuum, I would imagine that they are in a sense ill-equipped to deal with the challenges of the real world. The atmosphere around Jodie O’Shea is one of love and caring for people who don’t have much, but the reality is that isn’t the way most of the world works. Once the boys turn 17 or 18, they are men. Yet they really haven’t been exposed to any situations in which they’re called upon to be men, and continue to live in an environment filled with young children that caters specifically to their needs. I can’t imagine being on the cusp of adulthood in a place like that, where virtually all of the stimuli are geared towards someone so much younger than you. How are you supposed to begin to educate yourself about the world around you when there’s no one to help you do it? Sure, there is exposure to the volunteers and the older workers, but in reality that exposure is largely brief and barely scratches the surface. As I’ve said, I’ve visited the orphanage because Lauren worked there and was going back to visit. I don’t think that I would have gone on my own for the very reason that I was just describing…the majority of interactions that the kids have with volunteers are insubstantial and insignificant, and I don’t quite think it’s the best practice to have such fleeting adult presences in a place children call home. Call me old-fashioned, but I don’t believe that the orphanages should be treated like zoos. It might be OK for the little kids who just want someone to pick them up, but the older kids understand that you aren’t there for a long time, and as such there’s no real opportunity to forge any serious bond. So what sort of outlet might the teenagers have? They go to school, six days a week; that’s something. But is school going to enrapture them, and serve as an outlet where they can passionately express themselves? I’ve never been to school in Indonesia, but I sincerely doubt it. It’s is a quandary I don’t have an answer for. I’m not writing this because I have a solution, or critiquing the structure of an orphanage for having a structure insufficient to cope with the continued maturation of its children. Their basic needs are being met; Jodie O’Shea is a well-known and subsequently well-funded institution, so in a material sense they are provided for. Yet as we all know, there is more than material provision required raising a child up to be an adult. We need to have our minds cultivated, to be exposed to new things and have the opportunity to try different identities, and oftentimes fail, many times, before we know what we want to be in life. Very few Balinese, if any, have the opportunity to grow up in this way. While life in the orphanage might provide opportunity for the kids that a traditional community lacks, there is still a cavernous gap between the opportunities for personal growth and job placement available to them and what we are accustomed to in the Western world. Why Do First-World Travelers Feel Like Walking ATMs in Third-World Countries?